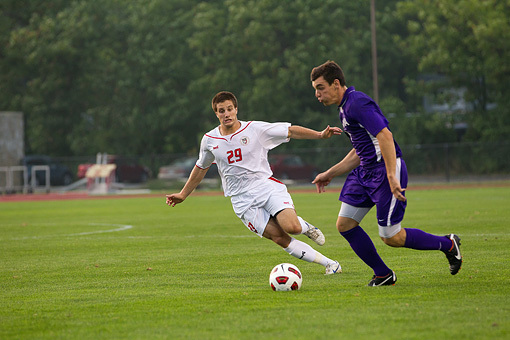 Daniel Haber '14 attempts to chase down a player from Niagara University in the Big Red men's soccer season opener on Sept. 2, 2011. 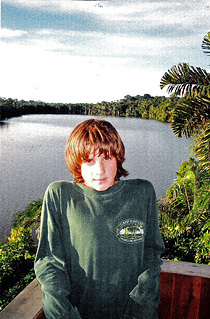 It was June 2004 and 12-year-old Daniel Haber was waiting. He was sitting in the emergency room at the Hospital for Sick Children in his hometown of Toronto. The clock had counted off five hours at this point, maybe six. Or maybe it had been seven. The time all blended together on this evening. Haber was with his parents, and they tried desperately to pass the time. Waiting with them were kids with minor maladies: broken arms, fevers, dislocated shoulders. Patients coming into the hospital with more urgent problems -- breathing difficulties, chest pains -- were moved ahead of Haber in the hospital's triage line. After all, why would the hospital suspect anything was seriously wrong with Haber? All he had was a bump on his forehead. 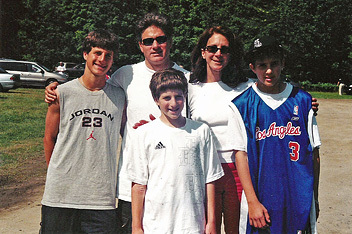 Daniel Haber, front, stands with his family on July 19, 2004, just after finishing his post-surgery treatment. Back row, from left: Jeremy Haber, Lorie Haber, Reena Berlind and Dylan Haber. Photo courtesy of the Haber family. It started with a sinus infection. About two weeks earlier, Haber had been suffering from normal sinus issues. A trip to the doctor, a little medicine, and he seemed to recover. His mother, Reena Berlind, remembers that even though Haber's sinuses had cleared up, he wasn't acting like his normal self. As a child, Haber loved nothing more than sports. He played center at the second-highest level of hockey and was involved with a highly ranked club soccer team. He was athletic, energetic, healthy and happy. A week after the sinus infection, while suited up for his club soccer squad, Haber noticed the bump on his forehead when he headed a ball. Haber and his father, Lorie Haber, investigated the bump in the bathroom mirror later that night. "It was almost like a half golf ball, a tender bump sticking out of the center of my forehead," Haber says. Haber went to the doctor on a Friday. The doctor said the bump would probably go away on its own, but if it didn't disappear after the long weekend, Haber should come back. By Tuesday, with the bump still as big as ever, Haber returned to the doctor. He checked out of school for his midday appointment with his pediatrician, thinking he'd be back in the class by the end of the school day. The doctor suggested they get the bump examined right away at the hospital. So Haber and his parents sat in the emergency room watching time pass, keeping one eye on the Stanley Cup final on TV and another on their card games. After several hours, a neurosurgeon decided Haber needed an MRI. The results painted an urgent picture. Haber had a condition called Potts' puffy tumor, a rare bacterial infection seen less than a half dozen times per year at the children's hospital. The infection had grown from Haber's initial sinus infection and was moving ominously toward his brain. Brain damage was weeks, maybe days in his future. Even today, Berlind starts to cry when she recounts the evening. "I tried to put on a very brave face," she says. "And I said to Daniel, 'I think you're going to need surgery tonight.'" His 12th birthday had been just five days earlier. "Originally I was just short of shocked and confused at this point," Haber says. "I had no idea what was going on. … I started to cry. I asked my mom, 'Is there anything else they can do? Is there any other way?' She said no." It took fewer than three hours to go from the first doctor seeing him to surgery. The mask went over his face. Haber in Peru during a family hike to Machu Picchu in December 2004. His hair is long, covering the scar underneath from his surgery just a few months earlier. Photo courtesty of the Haber family. Reena Berlind and Lorie Haber spent five hours feeling helpless while Daniel Haber underwent surgery. A craniotomy involves sawing off part of the skull. The doctors opened Haber's forehead, removed the cyst and reattached his skull cap using two titanium plates and more than 60 metal stitches. Haber's parents went to see him in his room, not knowing what to expect. They saw his head covered with bags and wrappings, protecting his still-raw wounds and fresh stitches. Haber opened his eyes. He had just one question for his parents. "I couldn't quite believe what I was hearing," Reena says -- her biggest worry was that her son would have brain damage after the surgery. "When he said that, it was like a huge weight had been lifted off my shoulders." The surgery had gone smoothly, but Haber had months of recovery ahead of him. He was able to return home after two weeks due to the medical care he received and the ongoing support of his friends and family. "He never once complained," Reena said. "We just made it work in our lives." Haber says he knew that complaining would have been pointless. Haber was allowed to play soccer again about three months later and hockey three months after that. With no physical limitations on his activity, he recommitted himself to soccer after taking some time off in high school, and enrolled at Cornell for the 2009-10 academic year. "That doctor saved my life," Haber says. "Everywhere that I am mentally, athletically, emotionally, the ability to act as a normal person and live a normal life, would not have been possible if they hadn't caught it at that moment." 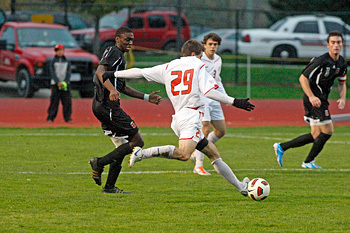 Haber, on the field for Cornell, winds up for a shot against Long Island University in September 2011. Haber was spectacular all of this past season. He led the team in almost every offensive category, twice won Ivy League Player of the Week and was named to the All-Ivy Second Team. And none of it would have been possible without the surgery that saved his life seven years earlier. "That's the biggest thing that had ever happened [to me]," Haber says. "It was the most impactful. It affected the way I thought, the way I saw my friends, the world around me, how much I appreciate life. I'm doing this because I love it now. I love that feeling of connecting with other players. It's what I live for."